As a huge Springsteen fan who has read countless books on the "Boss", this book has provided me the single greatest source of new information. 'Saint In The City', written by Craig Statham, covers the previously neglected years before 'Born To Run' and provides a clear insight into Springsteen's background, motives and inspirations. The book is written chronologically about the first 25 years of Springsteen's life. It covers his resentment against organised religion (a recurrent theme in his initial music), his testing relationship with his father and his musical enlightenment following the Beatles and the rest of the British Invasion. 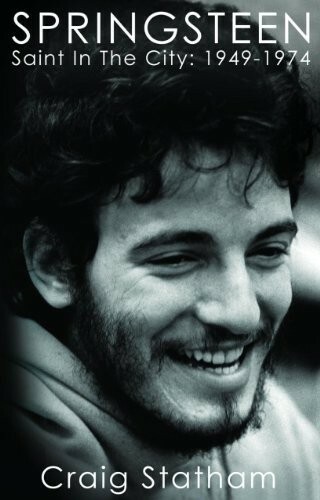 Springsteen was initially a big fish in the small pond of the New Jersey music scene and the book extensively covers his advancement in early bands, which included the Castiles, Steel Mill and the Bruce Springsteen Band. His jump from a moderately successful local band leader to a signed acoustic musician will never be fully explained but the book attempts to do this by showing Springsteen as always having a long term plan and continually making small compromises to finally get to the top. As a result, having being signed by Columbia as a Dylan-esque acoustic singer/songwriter which was the only available way to get a record contract, he immediately formed the E Street Band for his debut album, 'Greetings From Asbury Park'. Statham references all quotes and facts meticulously and has spoken to the near forgotten musicians, promoters and club owners who were involved with Springsteen's pre-fame years. Insights into the Springsteen alumni are included and the quote from Chuck Berry that Southside Johnny was a "white guy (who) can play the real blues" is priceless. Interestingly, the book portrays "Mad Dog" Lopez as the most prominent musician in Springsteen's early career and his removal from the band was a bigger deal than I previously thought. The book ends at the point of Jon Landau's legendary quote regarding "rock and roll future" and with the single 'Born To Run' on the horizon. For completeness and clarity, the book includes a series of family trees on Springsteen's early bands and some rare colour and black and white photos. I would call this book a must for Springsteen fans, especially those who appreciate the early albums and want to understand how the foundations for 'Born To Run' were laid.